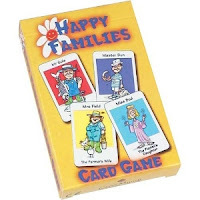 Happy Families is probably our most popular traditional family card game and like Farmyard Donkey and Pairs on Wheels it is great fun to play at a young age and with other family members. The pack contains 44 cards, which are grouped in 11 sets of 4. The game can be played with 3-6 players and the aim is to collect as many complete families as you can. Firstly, the cards are dealt out between players. The game starts with the player to the dealer's left asking another player for a specific card- this must go with a family member of a card they already hold. If the asked player does not have the card then it is their turn to ask for a family member. If the asked played has the card, it is given to the requester and the requester can then ask another player for a card. The game carries on this way until until there are no families separated among the players. The winner is the player with the most families.